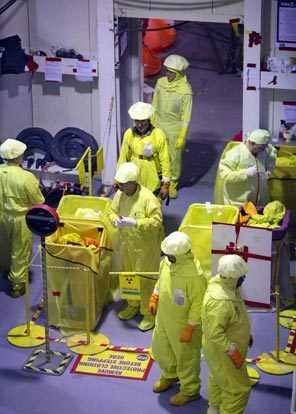 WASHINGTON -- Calling the Japan nuclear disaster "unacceptable," an expert task force convened by the Nuclear Regulatory Commission has concluded that nuclear power plants in the U.S. need better protections for rare, catastrophic events. The series of recommendations will reset the level of protection at the nation's 104 nuclear reactors after the worst nuclear disaster since Chernobyl by making them better prepared for incidents that they were not initially designed to handle. The panel will tell the commission that nuclear plant operators should be ordered to re-evaluate their earthquake and flood risk, add equipment to address simultaneous damage to multiple reactors and make sure electrical power and instruments are in place to monitor and cool spent fuel pools after a disaster. The report did not look at specific plants, including Energy Northwest's Columbia Generating Station near Richland. The NRC said that the 12 steps recommended in the report would "increase safety and redefine what level of protection to public health is regarded as adequate." The three-month investigation was triggered by the March 11 earthquake and tsunami that cut off all electrical power to the Fukushima Dai-ichi nuclear power plant in Japan, resulting in core damage at multiple reactors, the loss of cooling at spent fuel pools, hydrogen explosions and radioactive releases into the environment. The task force said that there is no imminent risk to public health and the environment from operating nuclear power plants in the U.S. But its members admit that the current patchwork of regulations is not given equal consideration or treatment by power plant operators or by the NRC, during its technical reviews and inspections. Rep. Ed Markey, D-Mass., the top Democrat on the House natural resources panel, urged the commission to move quickly to adopt the recommendations of the task force, saying "America's nuclear fleet remains vulnerable to a similar disaster." But Sen. James Inhofe, R-Okla., ranking member of the Senate environment committee, said such sweeping changes were premature. "Changes in our system may be necessary," Inhofe said, but "a nuclear accident in Japan should not be automatically be viewed as an indictment of U.S. institutional structures and nuclear safety requirements." The massive Gulf oil spill last year led to a temporary moratorium on deep-water oil and gas exploration. However, U.S. nuclear regulators have said repeatedly post-Japan that the nation's nuclear power plants are safe and should continue operating. Yet, as details about the Japan disaster began to emerge, so too did possible areas of improvement in emergency preparedness at the U.S. plants. After the Japan incident, the NRC ordered inspections at all nuclear plants to see if they were complying with requirements put in place after the Sept. 11, 2001, terrorist attacks to deal with extreme accidents. Inspectors found some minor problems, like wrong phone numbers for emergency personnel, a lack of training and buildings housing equipment that couldn't withstand a natural disaster. But none of the issues would jeopardize safety, the NRC said. The nuclear energy industry cited those results as reason not to jump to conclusions. At a public meeting in June, the NRC's chairman, Gregory Jaczko, specifically questioned why the U.S. isn't better prepared to deal with a prolonged station blackout, a situation in which electrical power and back-up emergency power are lost. That is what happened in Japan after the tsunami wiped out diesel generators. In the U.S., nuclear power plants are only required to cope for four to eight hours, the length of time batteries would last. After that, power is assumed to be restored. The task force is recommending that each operating plant and new reactor be required to deal with a complete loss of electrical power for eight hours, and be able to provide cooling to the radioactive core and spent fuel pool for 72 hours. They want earthquake and flood risks to be updated after 10 years, to account for the latest science. In addition, they want rules requiring more hands-on training and exercises for emergencies and plans to deal with disasters that strike multiple reactors at a plant. Most emergency guidelines now only deal with problems at a single reactor. The report will be formally presented to the full commission next week. NRC staff will continue to examine the safety of nuclear power in the U.S. as part of a six-month investigation.